Wednesday Stairs Training + Dinner! Join us for another training at Protected content . WE WON'T CANCEL THE ACTIVITY IF IT RAINS. We like challenges! 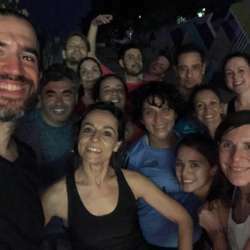 We welcome runners and walkers of any level, since the stairs allow us to have fun with different exercises. We will run/walk, climb the stairs, and workout our legs and core, and we'll do it together! Remember to bring your own water, I'll look out for our things.